A Tex-Mex favorite gets an island-style makeover in this quesadilla recipe, thanks to a filling that includes chopped mangos and a zesty dressing. Heat dressing in large skillet on medium-high heat. Add garlic, mango, pepper and cinnamon; cook 3 min. stirring often. Add chicken; cook 10 min. or until cooked through, stirring often. Remove mixture from skillet; keep warm. Spread 1 tsp. cream cheese on each tortilla. 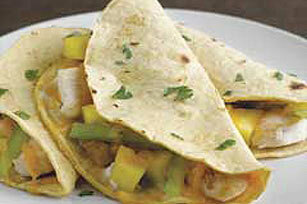 Spoon warm chicken mixture evenly on half of each tortilla; top each evenly with cheese. Fold in half. Heat skillet sprayed with cooking spray on medium-high heat. Place quesadillas in skillet; cook 2 min. Turn over; cook 2 min. or until cheese melts and edges are lightly browned. Try adding roasted poblano peppers or roasted red peppers for extra flavor. After handling raw chicken, wash hands in soapy water and do the same with anything that has come into contact with it. Cut each quesadillas into 3 wedges for a great appetizer!